Planning your bridal outfits is a daunting task we know. We’re here to help out! These five designers from the city know all about the right fabric, style and fit. You’ll have one less thing to worry about while planning your big day. With her flag ship store in Aundh, Radhika More’s designs are unique. She uses Indian fabrics, work and detailing and designs contemporary lehengas, sarees, gowns and more. Starting at INR 8,000 you can get a bespoke lehenga, something that’ll definitely complement that bridal glow. The newest designer on the block is already swamped with orders. Her expertise and designs are worth looking into. Starting at INR 6,000, whether you’re looking for machine zari work or a hand-embroidered lehenga that’ll make you look like a million bucks, Darade’s designs all about tradition and class. This Kothrud designer designs trends into more functional wear. From lehengas and sarees that step away from traditional designs to gowns and other evening wear, starting at INR 5,000 you can get your lehenga stitched in no time. She’s also designed and styled for a few TV celebrities, so this is probably the right boutique to hit up. Designing for a few celebs, Ginni Wadhwa has her design studio in Kondhwa. We don't know what's Pune done to deserve the numerous talented designers that dote the city. But, Wadhwa's ideas are worth a trip to Kondhwa. A small studio with big ideas, Wadhwa cuts cloth and chalks patterns, silhouettes and transcends everything into an outfit that would suit whatever occasion you want to wear it to. Known to create couture, diffusion and prêt-a-porter, Priyanka Raajiv’s designs have an Indian construct and have a flair of contemporary and western trends. Raajiv painstakingly designs a collection that's quite unique and it's guaranteed to get you several envious looks at any social event you wear her outfits to. 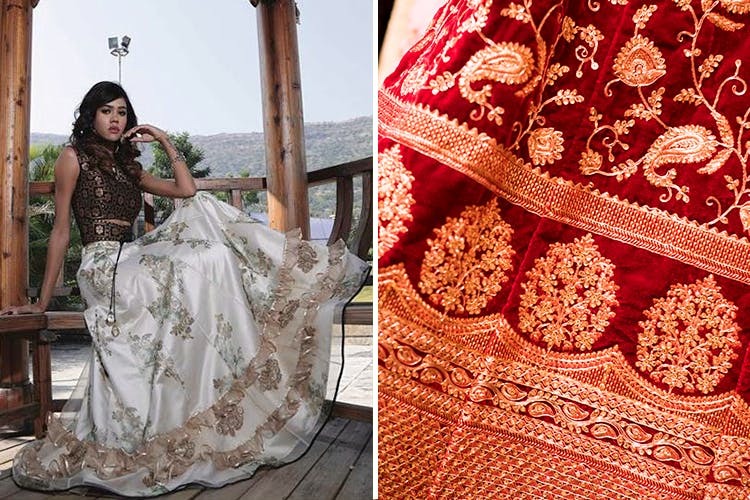 She loves to use embroidery in the outfits she makes, so your lehenga will surely be heavy and very bridal.